I wanted to do a quick December update on the blog here. We have a new sponsor and he has given us the deadline of January 9th, 2013 to collect all of the applications- then he will introduce a bill into law for these plates! If you haven't sent in your application yet, please do so as soon as possible. I know with the holidays this month, everyone is super busy- so the sooner you can send it in, the better! You can click the "Get Your Plate" tab above for all of the information. As of today, according to the ticker on the right side of the blog, we're just over halfway there (51%). But I have had a lot of help from some wonderful people who are also collecting applications and, technically, we have more than this. I'm not sure of the exact number, and those applications aren't yet in my file box- which is why the number stands at 51%. If we don't get the plates this year, we will keep collecting applications next year. I'm 100% confident we'll get enough next year to get us to 450, especially with Sweet Virginia's gift of honey incentives at events. I think that's all for now- if you have any questions, please let me know! Rally at E.P.A. to Save the Bees! Today I ventured via Metro over to DC for a rally in front of the EPA to save the bees. The main focus was on honeybees, but native bees were mentioned by a few speakers, too. Glad to see they got a shout-out! I prepared for the event by staying up until 3:00 last night working on my double-sided sign (which you'll see later in this post). I was exhausted! This was my 2nd time going to a rally. The first was the Rally to Restore Sanity, held on the Mall in DC, just a couple of weeks after I moved to the area. I thought it sounded interesting, but the main reason I went was because I knew a lot of my friends really, really wanted to go, but couldn't- they lived too far away, travel was expensive, they couldn't take off from work, etc. I went because I live in the area and considered it a privilege to be able to attend. I didn't make any crazy signs, and with over 200,000 people there, the event was much, much too crowded for my comfort level. But interesting experience nonetheless. Today's rally was a little different. True, part of the reason I wanted to go was, again, because I could. I talked with folks around the country who said if they lived closer, they would go. Well I live here. What's my excuse? Also, this is obviously a cause near and dear to my heart and I have strong feelings about it. If like-minded folks are going to go and have their voices being heard on the issue, I want to be part of that, damnit. If there was ever a rally worth attending- for me- it's this one. And, as someone who is possibly seen by others as a "pollinator representative [of Virginia[," I felt obligated to go. How can I call myself a pollinator enthusiast, and talk about standing up for pollinators and the importance of pollinator conservation, and then not go to an event specifically being held to possibly result in something that could make a HUGE positive impact on ALL of the pollinators? When it's less than an hour from my house, no less? After I saw a list of speakers attending the rally (which was schedule to only last an hour), I went from thinking I should go to being very excited about going. Maryam Henein, the creator of "Vanishing of the Bees" would be there, as well as David Hackenberg, one of the main beekeepers documented in the movie. I would have been happy to possibly meet either of them, but both? Super awesome. Then the day before the event, an annoucement came that Congressman Dennis Kucinich was also going to be there to speak. I remember back when he ran for president, he came up as my "ideal candidate" when I did a few of those online-quizzes to see who matches up best with your beliefs. Obviously he didn't get the nomination and sadly after January, he'll no longer be holding a position in congress. While it's a shame to no longer have someone so passionate about our bees, our food, and our environment in his position, I have no doubts that he'll continue to do very awesome things in the future- things he probably couldn't do with all the corruption and checks and balances in national politics. He was a very passionate speaker, and I learned that he has beehives too. It's clear he knows what's at stake here and won't give up until something is done to help our bees and clean up our food supply. Another powerful voice for the bees, Maryam Henein. I followed her progress during the making of her documentary, "Vanishing of the Bees," for years after I found out about it. It wasn't an easy or cheap project, but this is her passion, and she got it done. If you haven't seen it, I highly recommend it. In fact, I recommend watching it over and over and over again- I'm due for another viewing myself! One of the first to sound the alarm back in 2006 about the disappearance of honeybees. I've always wanted to meet him... and now I have! Unfortunately I didn't get to have a conversation with him, as he was in high demand for photos and everyone seemed to want to talk to him. My photo-op with Dave (and side 1 of my sign)! And a picture with Congressman Kucinich, with me making the squintiest and cheesiest of faces (and side 2 of my sign). I heard someone mention that they might do another similar rally in the Spring. I also heard via Maryam that representatives from Beyond Pesticides and Center for Food Safety were talking to the EPA this afternoon. Let's hope they've reconsidered their denial of our request (made months ago) to put a ban on NeoNics-- at least until further and actual scientific research can be done. Plate Update & Big Thanks! I'm pretty excited about the recent increase in applications we've had! I was happy when we hit- and then crossed- the 1/3rd mark at 150. 150 out of 450 doesn't sound like a lot, when you think about still needing 300 more applications. But 1/3rd seemed significant. And I was excited even as our percentage increased higher and higher into the 30's. When we hit 40%- and now stand at 42%, with more applications coming in- the 50% mark is well within reach! I owe a big giant thanks to Dan Price, of Sweet Virginia, for his incredibly generous donation of bottles of honey to give away at events as an incentive for folks to turn in their applications on the spot! So far I've only attended two small plant sales with the honey incentive and already collected 15 applications. It's a great start, and I'm lining up more events on my calendar all the time. Sweet Virginia is a charitable beekeeping (and now, flower farming) cooperative located in Northern Virginia. They're a non-profit and when they sell honey, or the flowers they've recently started farming, they donate all of those proceeds to different local charities. 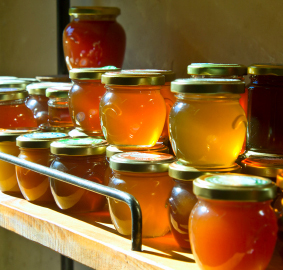 I am so proud to be giving away honey of THIS quality. It's local raw honey, produced from beehives near Manassas (I've seen them! ), Falls Church, and other places around the DC area. It's this gorgeous, deep amber color, and not translucent- so you know it's a MUCH higher quality than the el-cheapo stuff from the grocery store. Less processing = more pollen, and pollen is good for you! And the little sample bottles would make adorable wedding or shower favors, so if you're interested in making a donation and getting those, you should definitely contact Sweet Virginia! And if you know of any upcoming events where I might meet some like-minded pollinator supporters, please email me or leave a comment below. THANKS to the Washington Gardener Blog for sharing this earlier this week! That's how I heard about it, so now, I'm passing it along, too. Plant More Plants is an initiative that encourages people to... well, do just that. Their main concern is water runoff which carries pollution through waterways and into the bay- but they emphasize there are MANY great reasons to plant more plants! - The pollinators will love you! (What other reason did you think I would mention first and foremost?) :) If you plant native plants that provide nectar for the pollinators, you're providing them with food supply. - Stormwater runoff causes pollutants to contaminate streams and rivers and it all makes its way into the Chesapeake Bay. Plants help prevent stormwater runoff! - Plants also help prevent erosion! - If you plant native plants, they'll need less maintenance and water (and overall care) than other non-native plants. So you'll save water and save time (and money) in having to keep up with them. - If you have less lawn to mow, it will take you less time to mow it. Ok, that one is kind of a "duh!" but think about how you could gradually reduce your lawn over time- my neighbor plans to completely eradicate his front lawn gradually over the next couple of years by adding more plants. Rick James emerged from his chrysalis yesterday morning. 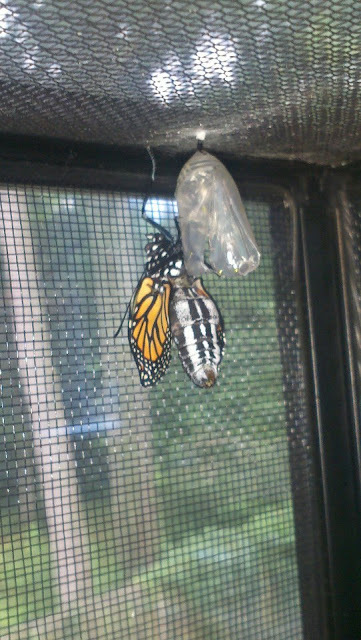 I was so happy to have another healthy butterfly, but admittedly I was a bit sad, too. I had expected Rick and Charlie to emerge at almost the same time (given their past), but Charlie's chrysalis was still quite green and had at least another day to go. I waited for Rick James' wings to unfold fully, and even though he wasn't flapping around with the same anxious flutter as Eddie Murphy, I figured I had better get him outside so he could start eating right away. I kept him fed as a caterpillar- and certainly didn't want to starve him as a butterfly! Besides making friends with this bee, Rick James didn't... do much. He had a double-proboscis going, which worried me a little, until I read that that's normal until the two tubes fuse together. It was a nice, sunny day, so I left him to feed on the milkweed and figured I'd come back and check on him later. About half an hour passed, and he was still there, in the same place. I waited another hour- same thing. He stayed on the plant for about 4 hours, and it started looking stormy outside... so back in he came. I set up some flowers in a vase, hoping if he needed to eat, they would suffice. It occurred to me that maybe... possibly?... could he be waiting for Charlie Murphy? He spent the rest of the night in the screened cage hanging on one of the walls. Not flying around. Not even so much as attempting to fly around. This morning, Charlie Murphy's chrysalis was very, very transparent. I knew he would be coming out today! Rick James was still just sitting there, hanging on the wall. After a trip down to Maryland and into the office for work, I returned home and when I went upstairs, I heard the sound of wings flapping! There they were! Both flapping, fluttering around, seeming very ready to go! And guess what?.... Charlie Murphy is a female! They were alone in that cage all day, unsupervised... Charlie could be pregnant by now. My oh my. What will the media say when they find out Rick James has knocked up Charlie Murphy??? I transferred them both into the transportation plastic container and the three of us went outside. And out to the milkweed we went. I placed Rick James on a flower... and he did the same thing as yesterday: Just sat there. Yes, Rick. You're glorious. BUT CAN YOU FLY!? I reached into the container to let Charlie Murphy climb on to my finger, and just as I took my hand out of the container, Charlie Murphy took off to go and roost way up high in our Redbud tree! I was a little sad that she didn't want to sip some nectar with Rick James before she left. I was also concerned that Rick James still hadn't made any attempt whatsoever to fly. I held my finger out to him and he climbed on. I walked him over to Charlie Murphy and he just sat there. Then he peed on my hand. I walked him around some more, hoping to let him feel the breeze? Look around? See something he liked? I don't know. Eventually I placed him back on the milkweed and went inside to wash my hand. When I came back out, he was still there on the milkweed. I figured I'd give it one last go to try and get him airborne and gently moved my finger underneath him.... and he immediately took off, up, over and past a neighbor's house, far away into the woods! I was kind of sad I didn't get to have one last look at him roosting in a tree, like I did with Eddie and Charlie. I was also kind of sad that he didn't fly into the Redbud to join Charlie again. I went to the Redbud to check on Charlie... and she was gone. They could have both gone their separate ways, but who knows... maybe she flew off to a tree behind the neighbor's house and Rick James went to join her. A new butterfly, a flail, a release. Yesterday was quite an exciting day. Almost a tragic day, but had a happy ending. I was in Norfolk this past weekend for a National Honeybee Day event at Norfolk Botanical Garden. I had left the butterfly chrysalises and new caterpillars with my husband for the weekend. I figured the chrysalises would just sit there, and the tiny caterpillars might need more food, if anything, but I left them with plenty. I got home around 7 last night when my husband was in the middle of his Insanity workout. I went to say hello to him and he said, very excitedly, "I have some good news for you!" My real guess was that the caterpillars upstairs were still doing well and that all were healthy, but I guessed a couple of joke-guesses first. Then the real news surprised me.... he said "You have a butterfly upstairs!" "EDDIE MURPHY!?!?! ALREADY!? OH, GOD! How did you know? Did you watch him come out?" "No, I heard him flapping around in there." I dropped my things on the table and rushed upstairs. Sure enough, there he was, crawling all around the ceiling of the screened cage! "Oh geez, we have to let him out!" Now, looking back... it was evening and had the possibility of raining later in the night, so it would have probably been fine- better, even?- to just grab some flowers from outside and bring them in to feed him for the night, then release him the next day. I took the plants and caterpillars out of their big plastic container, thinking I would use that container to transport Eddie Murphy from the screened cage, through our house, and out to the great outdoors. I put a stick into the cage, thinking he would climb on, but he didn't. Of course. Because what would appeal to him about a stick? I went out and got a Black Eyed Susan from the garden, then brought that in... again, thinking- of course, he would climb right on and I'd put him and the flower into the container. Eventually- after I cornered him and basically forced him to- he did climb onto the flower. Gently, ever so gently, I pulled the flower from the cage. As I carefully placed the flower into the new container, he suddenly fluttered right up and landed a windowsill! My response was to yell at him as I made my way over to him. "Eddie Murphy! Of all the places-- there are probably spider webs and everything there- if you get caught in one--"
"ARE YOU KIDDING ME!!!! This is so typical! This would only happen to me." 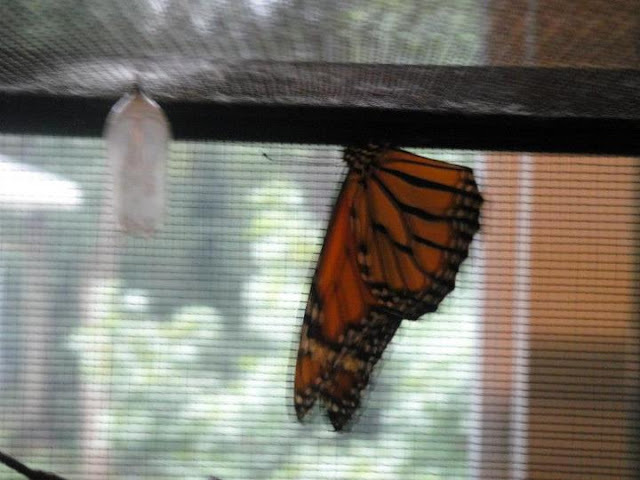 I helplessly listened to him flapping around back there, certain that he was tearing up his brand new butterfly wings, envisioning him unable to fully enjoy his new butterfly life. How sad. My husband immediately went to work, pulling things out of the way so we could get to the bottom of the shelf and move the whole thing out away from the wall. I helped him, meanwhile hoping Eddie would make his way to a place where I could easily reach him. Instead of trying to give him a little flower to climb on, I offered my finger. He climbed on right away and I was able to easily get him into the container. You're probably wondering why I didn't just take the entire screened cage outside and open it and release him that way? I've been trying to disturb the cage as little as possible so as not to accidentally bump the other chrysalises around too much. We took Eddie outside and over to a milkweed plant, but he wouldn't leave the plastic container. I reached in and without hesitation, he climbed back onto my finger. I placed my hand on the plant, and he immediately began sipping from the flowers. That was a very exciting thing to see. I mean, he looked perfectly healthy, but sooooo many things can go wrong with these guys. Parasites, sickness, all kinds of weird things that will cause abnormalities such as a deformed proboscis. We still had to wait a bit to see if his wings were going to work properly, after all that flailing around in the house- I was nervous and unsure. After about 10 minutes of nectaring, Eddie took his first flight! Great success! He went right up into this tree. Good luck and good bye, Eddie! Bon Voyage! This is a somewhat silly post I meant to write last week, but I'm glad I didn't since today there was something significant to add. Two of my caterpillars, Charlie Murphy and Rick James, have been inseparable almost from birth. They were the 2nd and 3rd caterpillars born from about 12 eggs I collected 2 weekends ago. Charlie Murphy & Rick James, their first day of life. Charlie Murphy & Rick James, day two. I kept big (and a few small) leaves in the container to be sure everyone was well fed (I ended up with 7 or 8 baby caterpillars in all), and as the caterpillars grew bigger, I added enough leaves so that everyone could each have their own. But for these two, the number of leaves was irrelevant. No matter how many leaves were in the container, or how much exploring they did of said leaves, they always ended up eating on the same one. Day 4, sharing another leaf. Eventually I put all of the little caterpillars into a bigger container- I was down to 6 of them at that point. I knew they would need more room as they got bigger. However, Charlie Murphy and Rick James- true to form- remained constantly close, even after being given more space. I had never seen caterpillars act like this before, and thought maybe I had the wrong impression of these two. Maybe they weren't best friends... but more like mutual bullies- rivals, even- who enjoy a good territorial battle and wouldn't leave each other alone no matter how many leaves I added. But the fighting phase lasted only a short time. (Well, everything with caterpillars only lasts a short time, but that's beside the point.) As the caterpillars got older (and more mature), Charlie Murphy and Rick James' bond seemed to grow stronger. Eventually I transferred the caterpillars into another new container- a big screened in cage. The new cage would give them plenty of air circulation and lots of climbing space to use when they decided to wander around in search of just the right space to form a chrysalis. It reached a point where I no longer thought it was just my imagination. Later this same day, I was working late in our home office, where the caterpillar cage is located- on the desk, next to the computer. I finished up with work around 1 in the morning and decided to peek over at the caterpillars to see what was going on. Oh no! Charlie Murphy and Rick James are surely about to fight again! I watched them and waited, hoping I wouldn't have to intervene. They stayed in this position- not moving at all, and I realized they weren't going to fight. It seemed like they might have even been sleeping, they were so still. As you can probably tell from the above picture, the caterpillars are really huge now- about 2 inches long. Yesterday I came home from running some errands. Eddie Murphy, the eldest caterpillar, had formed a chrysalis- which was very exciting! And Charlie Murphy and Rick James had both started wandering, climbing around, looking for a place to make their chrysalis as well. Charlie Murphy in the foreground; Rick James in the back. I am amazed at how in tune the two of them are. Even at this late, late stage in their lives, when it seems like the amount of time that it takes to do what they have left to do can vary greatly (9 hours? 15 hours? 20 hours? )- they both began to spin silk on the top of the cage at the same time. And- I can't make this up, I was sitting in the room with them when it happened- they both dropped down into their hanging "J" position within about 10 minutes of each other. Sorry for the poor quality of this photo. I took this picture through the screen- not wanting to open the door and shake the cage too much while they were in this fragile position. When I woke up this morning, I was anxious to see what Charlie and Rick had done during the night. Had they already shed their skins one last time? Would one be a chrysalis, the other still in a "J"? When I walked in and saw them, my heart immediately sunk. For they were both hanging straight down, no longer in the "J" shape. So you can imagine my sadness to see these two, both hanging there, straight down. But I got closer, and realized they were still green and swollen looking- not rust-colored and shrunken, like the infected caterpillar. I took a look at them from another angle and couldn't believe what I was seeing- so, of course, I grabbed my camera. This is the rest of the process. I decided to take video from a different angle. I apologize in advance for all of the movement in the middle of this video- I could tell my camera lost focus and I was moving around, trying to get it to re-focus on the pupating caterpillar in the foreground. I feel like I was witnessing one of those old Disney movies, where it's created from actual films of animals rather than animation. "Charlie Murphy and Rick James: A Tale of Friendship, Eating, and Pooping." (See the follow up here! Eddie Murphy is about 2 inches long! I'll admit, for the first week, things weren't as interesting after their initial emergence from the eggs. They ate. They pooped a lot of little poops. They seemed to sleep a lot, or maybe were just in a constant flux of eat, food coma, eat, food coma. I gave them fresh leaves every day not because they were comsuming everything, but to be sure the leaves were tender and moist enough for them to enjoy. This picture was taken yesterday morning. By the evening, these were about an inch and a half long. And as you can see from the top photo, taken today, they're at about 2 inches. According to most of what I'vr read, the caterpillars are caterpillars for about 2 weeks before they pupate, so that should be happening within the next few days! Their big screened in container JUST arrived in the mail, but I have too much work to do to assemble it this very minute. I'm excited to get them in there later tonight and also to see just how big they get before they're done growing!!! A weird thing happened yesterday. 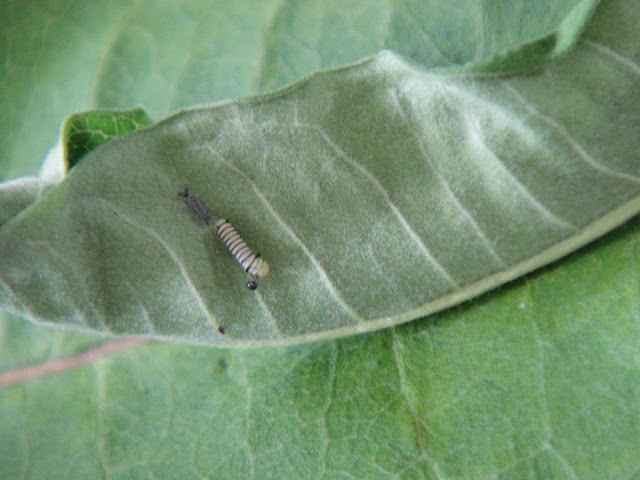 When I gave the caterpillars fresh new leaves, I added a moist paper towel to the bottom of the leaf, then put a little piece of plastic wrap around it and sealed it up with a rubber band. I *thought* that would keep the leaves fresh for a longer time- but those leaves actually seem like they dried up MORE quickly! Maybe the paper towel absorbed moisture instead of giving it? I don't know. As a result, the caterpillars are taking a short (3 hour) road trip with me today to my grandparents' house! I will only be gone a night, but will be getting back late tomorrow and I want the little guys to have fresh leaves when they need them. Plus my grandparents have milkweed in their yard. Look at Charlie Murphy and Eddie Murphy... they are getting so big! They insist on staying on the old leaves, even though I have given them fresh ones- and those old leaves are starting to curl up, which makes them hard to find. And I still have 3 eggs waiting to hatch, so I must have miscounted when I originally collected them. I located Eddie Murphy, and saw something black on his face. My first thought was, "Aw, geeez, why is there poop on his face? Is he playing in it? Or did he just make so much of it that crawling through it was unavoidable?" He was squirming around, trying to get it off, and I realized that I wasn't seeing poop. See the long, gray thing behind him? That's his skin. I had NO idea he would already be shedding his skin only 2 days into his short life! So the black thing in front, which doesn't look like poop at all, is his head capsule. And look! He has the teeniest, tiniest, little nubbly antennae! Awwwwwww! This is all pretty new to me, but from what I understand, as the caterpillar grows and gets ready to shed his skin, the layer on top of its face gets hard and sort of pops off as one piece. So his face comes off like a helmet, and his skin comes off kinda like a jacket. Think of Chris Farley doing "Fat guy in a little coat." 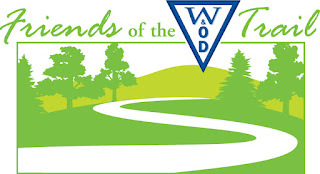 Saturday, July 28, I ran in the "Friends of the W&OD Trail 10k." I had promised that if we reached the 200 applications mark by race day, I'd run this race in a bee costume. But alas... We fell short... by almost 80 applications. I never thought I'd say this, but lacking in applications that day was actually a blessing. It was HOT, HOT, HOT and sooooooo humid. It was miserable. The bee costume would have been a one-time-use only because I don't think it would have made a full recovery from THAT much sweat. Since it's been so hot outside, my running routine before the race was pretty minimal- about 4 miles, once a week. I've also been doing Insanity 6 days a week, and this race happened to fall on the Saturday before the recovery week in the middle of the program... thank goodness :) Insanity has definitely helped my endurance, but I am not sure much of anything would help me feel GOOD running in 90+ degree weather with the same percent (or more) humidity. So my time was nothing to brag about (my Garmin said about 1:09:34), but considering this is the furthest I've attempted to run since the Marine Corps Marathon last year, and my past issues with plantar fasciitis, and the awful weather, I'm not too disappointed. 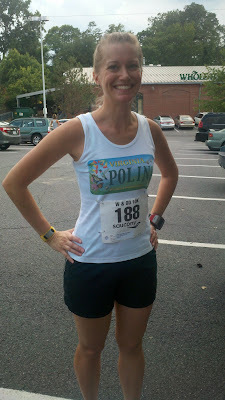 Oh, and sadly NO one asked about my Pollinator Plates shirt! On the back the shirt says, "Ask me how to get yours!" with another picture of the plate. My husband wore his too, and, nothin'. Maybe in the race when I wear the bee costume I'll put a mock-up license plate on the back of my shorts, right on my behind. If you're a fan of pollinators, you've probably got a pollinator garden with plenty of flowering nectar sources (and host plants for caterpillars)! During an intense, dry heat wave, all of our planty pals need a little help- not to mention the pollinators and other wildlife, too! Native plants have evolved and adapted to the specific conditions in your area, including how much precipitation your region typically gets. Buying native plants is like having a customized garden designed by nature specifically for you! Good- Look for plants at nurseries, even the "big box stores," labelled "Native." However, some of these plants are U.S. natives, and may not specifically be native to your area. Best- Contact your local Native Plant Society and/or look for native plant sales in your area. You can usually find these sales going on in Spring and Fall, which is also the best time of year to plant. Planting early or late in the year will enable the plant to develop a substantial root system before the heat of summer, or before going dormant in winter. A plant that is more established will require less water and maintenance. In most cases, a lawn isn't a sustainable landscape, and does nothing for pollinators (unless you allow clover and other small flowers to grow in it). Shrubs and established plants, especially native plants, will require less watering than a lawn. Better- Devote an entire section of your yard to a native meadow garden (or a shady garden). You won't have to mow or pull weeds- just plant lots of native plants and allow them to spread and self-seed freely. Best- Take out your entire lawn and create a beautiful garden full of shrubs, perennials, groundcover, and allow for a meadow (or "wild") area as well. Good- Install a rain barrel and use it to fill up your watering can. Better- Install a rain barrel and attach a hose to it. Turn on the spigot and move the hose around your yard. Allow the water to slowly trickle out directly onto the base of individual plants for a slow, deep watering. Best- Install multiple rain barrels so you can easily access all areas of your yard with the water you've collected. If you kept the drain of you sink closed at all times, you'd be surprised how much water is going down there! So... Plug it up! You probably don't want to use your soapy water on your plants, but you can collect the water you've used for things like washing fruits and vegetables, boiling eggs or potatoes, etc. Good- Plug the drain in your sink when washing fruits and vegetables. Use a cup to transfer the water from your sink into your watering can. Also, take the water from pots that you've used to boil eggs or potatoes, or steam vegetables, and pour it on plants outside (after it's cool). Better- In addition to the above, take your house plants and small potted plants into the shower with you- just try not to get too much soap on them, and give them a good rinse when you're done. If you use a dehumidifier in your house, use the water it collects to water your plants. If you have a fish tank, you can dump the water from it onto your plants when you're cleaning the tank. The water contains lots of nutrients that the plants love! Best- Install a gray water irrigation system at your house. A friend of mine lived in the Caribbean, where it gets quite hot, as you can imagine. Her father planted beautiful flower gardens all around their house and the neighbors insisted he was crazy and that he would never be able to keep up with the watering (they had strict water conservation laws there). He installed a gray water system and everyone was astounded at the beauty of his landscaping! Mulch and leaves help keep water from evaporating. Fallen leaves contain valuable nutrients- don't waste them! Good- Buy mulch and wood chips and spread them in flower beds to prevent weeds and slow evaporation of water. Better- Some local recycling facilities collect yard waste and debris from storms to create mulch... and some give it away for free. Call around to see if you can find free mulch in your area! Best- Let the leaves that fall in Autumn stay in the flower beds. Pile them up around shrubs and plants (but not directly touching the base of the plants) to protect the plants over the winter, and leave them there as a mulch during the summer. Or in spring, you can rake them out and mow over them to shred them, then place them back in your beds. 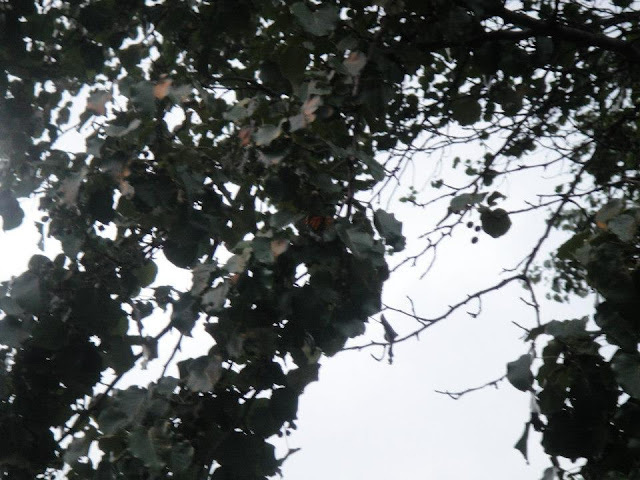 Keeping a thin layer of leaves allows water to reach the plants and keeps it from evaporating. Here is a GREAT and short (3 minute) video about making your own mulch from leaves! When water is scarce, there is hardly enough to go around. Make sure your valuable plants aren't competing with the undesirables! Good- Even just a little bit of time every day (half an hour) spent pulling weeds can help keep your flower beds clear. Better- See #5 above- keeping mulch and leaves on your beds will help cut down on the weeds. Best- When you pull the weeds, add them back into your compost! This can be done in conjunction with other steps above. The idea is to water very slowly and deeply- think quality versus quantity. Good- Use a soaker hose. You can also use a small sprinkler with your hose turned on a very low setting and move it around to different plants/parts of your yard. Better- Use a container- this is more precise. I used an empty kitty-litter jug. I pierced 2 small holes (with a corkscrew) about an inch apart, in the bottom of the container. Fill the container up, and set the container at the base of a shrub or newly planted tree. The water drips out slowly, and you know exactly how much water the plant is getting! This keeps the water from evaporating quickly and being wasted. 9. Wildlife is Thirsty, Too! Have you ever noticed when you've used a watering can or sprinkler to water plants, bees and butterflies will descend upon the freshly watered plant? They're drinking the water left on the leaves, and these little guys are thirsty! Good- Have a bird bath or other water source in your yard. Fill it with fresh water daily. Add ice on very hot days! Birds aren't the only ones who take advantage of bird baths- I see squirrels and chipmunks drinking from ours all the time! Better- In addition to a bird bath (or other water source), add a puddling area for the pollinators. This can be a flat place in your garden with a couple of bricks or flat rocks- try to keep them damp. It can be a very shallow dish, like a plate, with some rocks, sticks, wood chips, etc. where butterflies and bees (and other insects) can safely land and have a drink. Best- A little running water attracts wildlife. Of course, keeping water running or bubbling requires energy. You can find many solar-powered fountains online and the birds and other wildlife just love them! Many come up when I have done online searches. What do you do to conserve water but keep your gardens and wildlife healthy? Did I miss something? Please leave a comment and let us know! Have you ever been walking (or driving) through your neighborhood and seen signs in people's gardens, but you weren't sure what they meant? Did you ever stop to ask? 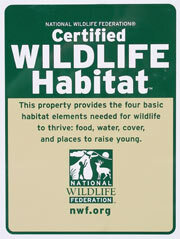 I've seen a few of the National Wildlife Federation's "Certified Wildlife Habitat" signs in my own neighborhood, and I also have one myself. 4. Provide nesting areas/areas to raise young. You can do this for any wildlife- squirrels, chipmunks, birds, and of course... bugs and pollinators! For pollinators, you can provide nectar-rich flowers and host plants for food, a puddling area (very shallow dish with water and/or mud) for water, and for most pollinators, shelter doubles as the nesting area- so you can provide a bee house, or leave piles of leaves/sticks, and patches of mulch-free bare ground for bees to make nests. I've also seen one of these cute ladybug "Pesticide Free Zone" signs in a neighborhood yard (with lovely gardens). I was curious about the sign, so I looked it up, and found "Beyond Pesticides" where you can pledge to keep your lawn and garden pesticide free and order your sign to proudly proclaim your poison-free space! I think what's great about this sign is, if you've got an especially beautiful garden and you display the sign, people are going to notice- and they'll be impressed. "Wow, they didn't need nasty chemicals to make their garden look like that." 1. Protect bees from pesticides- don't use them! 4. Provide shelter and cover for bees- such as a beehouse or undisturbed/unmulched ground. And when you register your SHARE space, you have the option to order a sign for your area, too. I haven't seen a picture of the sign on their website yet- I think this is a somewhat new initiative and perhaps they haven't uploaded one yet. But I made the donation and ordered mine yesterday- when it comes, I'll post a pic! 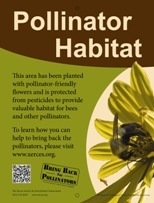 The Xerces Society also offers a beautiful and informative "Pollinator Habitat" sign for your garden. 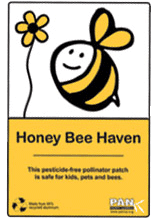 The fine print says that you've planted pollinator-friendly plants and kept pesticides out of the area. The sign is part of Xerces Society's "Bring Back the Pollinators!" campaign. 4. Talk to your friends/family/neighbors about the importance of pollinators end encourage them to join in your efforts (kind of like the goal of this license plate!). With so many great programs and neat signs out there, it's hard to choose just one. I think having some sort of sign in your front gardens does help promote conversation about pollinator (and other wildlife) conservation, and these are all great causes, too! First of all, of course-- what better time to show your support of pollinators by sending in your application and helping to BEE a part of getting these plates onto Virginia roads! Peer pressure! You know you wanna! Yesterday I attended the Pollinator Partnership's "Pollinator Week Briefing and Break" in DC (and hellooooooooooo Haagen Daaz coffee ice cream!) and learned about their S.H.A.R.E. campaign for the environment! The acronym stands for "Simply Have Areas Reserved for the Environment." What could be simpler than that? A section of your garden, a corner of your lawn, a few potted native plants on your patio- easy, peasy! 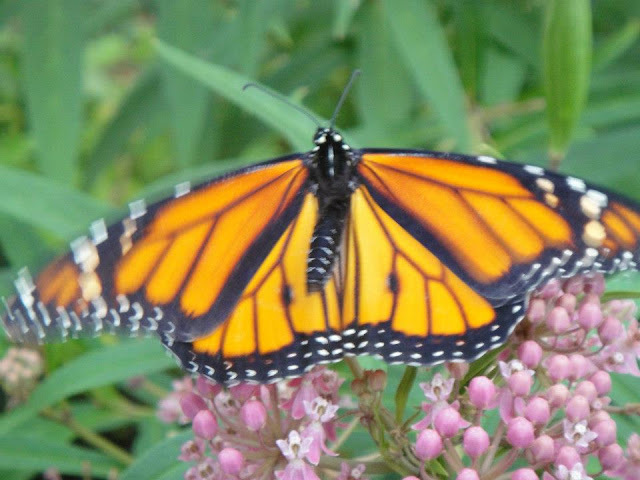 You can learn more about the program here- and if you've already got a pollinator/bird/wildlife garden, don't forget to click the "register" button and register your landscape spot, so you can monitor and report what you're seeing! Speaking of monitoring habitats, have you seen the Native Buzz site from the University of Florida? They're asking anyone who has a bee house/nest site to come on over to their page and register your location. Then as you see different bees and wasps emerging, send them a report on your habitat. The honey bee population is pretty well monitored since beekeepers have to put a whole lot of work into their bees! But the native and solitary bee populations are a little harder to keep up with- so reporting your bees and wasps to the Native Buzz project will help scientists with information on native bee populations. Buzz on over! 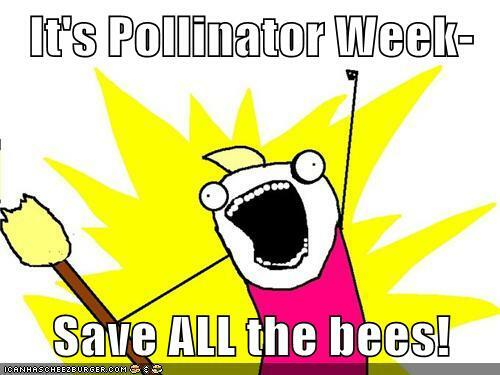 These are just a few things you can do to help out the pollinators; I hope it's useful in helping you find ways to participate in Pollinator Week! Yesterday I went running and added a stop by the post office to my loop. Imagine how excited I was when I found a bunch more applications in there- and knew it would be just enough for us to finally hit the big 100! !